It's been mentioned that football is the greatest game ever invented. Judging by the amount of people who go to matches, watch it on TV and actually play the game. I tend to be in agreement with whoever uttered those words. It's not suprising that the computer football game is far more popular than any other genre. The arcade games sell well, but it is the management simulation that has been top of the league for the last few years. You can thank Gremlin for this because when it released the original Premier Manager a few years ago it created a game that was as close to football management as you could possibly get. The Sheffield-based software hose then created a sequel which surpassed the original and now Gremlin Interactive is hoping that the third game in the series will do just as well. Looking back at Gremlin's track record, I can't see anything but success for the latest Premier Manager offering. A bit of a bold thing to say in the introduction, but I've already played it you see and it's rather good. Although graphics and sound are quite important in a piece of software, I'm sure fans of the game would much rather know about all the new features included. One of the major new features is the introduction of an Assistant Manager. This person can help with the day-to-day running of the club, leaving you to sort out the running of the team. He/she can do the training schedules, treat injured players, check sponsor boards, hire and fire employees and negotiate player contracts. All these tedious jobs which were a pain in the previous games are now a thing of the past, although it depends on how good your Assistant is as to how much he/she does. A new transfer system has been incorporated which lets you see other club's bids, allowing you to raise yours accordingly at the right moment. This time around you haven't got as much money to start with and you must try and get the money off your tight-fisted directors to buy players. The most interesting feature of all is the new tactics editor. You can now change what each player does and where he plays on the pitch. For example, you can decide how far out from goal each player shoots from or you can tell each of your defenders to clear the ball whenever they receive it, and so it goes on. What you get is a far more in-depth game and your decisions really do affect how your team performs. A feature which you should be very wary of is the fact that you can now be sacked immediately in mid-season if your management performance isn't up to scratch. Obviously you only have to look back at the previous Premier Manager games to find a game of the football management simulation variety. Ignoring these though, there are a whole wealth of management games out in the shops and most of them are pretty damn good. A firm favourite and Premier Manager's closest competitor is Championship Manager which has sold incredibly well over the last couple of years plus it's been faithfully supported by a whole range of data disks. On the Ball: World Cup and League Editions have been the latest additions to the football management fold and with their fancy TV style graphics they're sure to put up a lot of competition. Even Sensible World of Soccer has got a new management aspect to it and no doubt this will be a big seller, but in my opinion nothing compares to Gremlin's Premier Manager series. There really isn't a need for superb sound effects and music in a game of this type. That said, Premier Manager 3 does contain a fair smattering of sound. 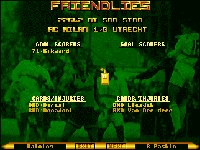 The match sequence comes complete with crowd effects and you're even treated to a selection of sampled speech when something happens within the game. The introduction tune is quite good, but I'm sure dedicated gamers will skip past it to simply get to playing the game. However, if it didn't have a piece of introduction music I'm sure you'd get people whinging and complaining. What sound is in the simulation is good, but you don't really need any sound whatsoever to make this type of game a success. This latest version has been given a good lick of paint in several areas. First is the actual backdrop to the main menu which can now be user-defined. All the colours of the rainbow are in there and it's all down to you how good the game looks. The ground improvements screen now features a full stadium and although it's a superficial change, it does look rather nice. The biggest change appears when you finally get around to playing a match. Gremlin Interactive has scrapped the animations of Premier Manager 2 and introduced a full stadium that comes complete with players in correct strips into the management fray. This means you get to know exactly where the ball is at all times and it's a lot clearer to know exactly where you're going. The players can even be changed into shirt's numbers so that the screen isn't so cluttered, and if you don't fancy any of these new graphics then they can be simply turned off. The rest of the menus and screens are very similar to the ones found in the first sequel, but on the whole Premier Manager 3 looks a lot more polished and better presented than it's predecessors. With the introduction of loads of new and innovative features, there wasn't any question that this third game in the series wouldn't be good. Even though it's about a year since I played around on the last one, I picked up the Premier Manager swing of things almost immediately. The new graphical inclusions really do set Gremlin Interactive's management simulation apart from the rest. The game is now just about perfect and Realms of Fantasy has included everything that you could possible want in a football management game. I suppose if you bought the first and second games then you might want to, to financial reasons, steer clear of the product, but then again, by buying both those games you must be a bit of a fan and I expect that this third game is already on your shopping list. As far as gameplay goes, Premier Manager 3 is in a class of its own, but where it really scores is in the addiction stakes. I raise my hand now and admit that I did play Premier Manager 2 into the early hours when I should have gone out and had a life. I fear that Premier Manager 3 will have the same effect on me, so I'm locking it away, such is its addictive power. If you loved the previous installments then you'll want Premier Manager 3. For football management beginners there isn't a better game on the planet to get you started. A better layout for this page would have been the headline "Premier manager 3" with the words "buy it" underneath. So what are you waiting for? Steve Bradley comes off the pitch and into the manager's box. But is it really more challenging than handing out the oranges at half-time? The popularity of the football management genre shows no sign of warning. A glance at the charts of any given month reveals their selling power - there always seems to be at least one in the top 10. Premier Manager 2 has hung around the upper echelons for months and no matter what the marketing deals which enable its lofty placing, people still buy it. After the glorious soap opera that was On The Ball (World Cup Edition), Premier Manager 3 marks a return to the more sober aspects of football management, where the gaffer has 101 things to worry about during his working day. This time, however, Gremlin have kindly provided you with an assistant manager to help out, though you might find him as much a hindrance as a help unless you carefully monitor his activities. The major advance in Premier Manager 3 is the matchplay interface where you can watch a representation of your games, giving you an overview of how your team are performing and what their strengths and weaknesses are. And with the option to set the match speed, you can follow play as closely as you wish. This new addition works surprisingly well. Another welcome addition is the European transfer market - not that you have hope in hell of signing an overseas player as manager of a Conference team, but you can trawl the lower leagues for bargains. Buying is based on a bidding system and you come up against stiff opposition from other clubs. Loaning players from other teams is often the best way around this as you attempt to paper the cracks in your early seasons. As with the earlier Premier Manager games, the user interface is clearly laid out and easily accessible, but you don't need to know this. What you do need to know is that Premier Manager 3 is extremely tough and even hardened players will find the going difficult. Occasionally, some of the player stats seem rather harsh - if a player misses a tackle during the first half, he can get a ridiculously low rating, as you don't get any great detail about the opposition either. Devotees of management sims will, no doubt, find Premier Manager 3 a challenge while less experienced players will discover that managing a football club is no picnic. But Premier Manager 3 is an excellent example of the genre and the significant advances in the gameplay ensure that it's worth buying. Novices, though, may want to look elsewhere. Incredibly difficult - you may decide to give up altogether and head for the pub/cliff face. Der von Grund auf deutsche "Bundi" hat ja bereits seinen Hattrick auf den Digi-Rasen gelegt, jetzt ist es am britischen Gegenstück, den dritten Anlauf zu wagen - ein weiteres Fest für Fußballmanager? Kaum, denn das Team um John Atkinson hat sich auf die Beliebtheit des Vorgängers bei den Insel-Kickern verlassen und daher drastisch Änderungen konsequent vermieden. Und so dürfen sich eben wieder bis zu zwei Spieler von der fünften Division bis an die Spitze der englischen Eliteliga hocharbeiten, wobei ihnen neuerdings mehr Freiheit bei der Mannschaftsaufstellung geboten wird: Die Jungs können nach Gutdünken auf dem in 15 Zonen unterteilten Spielfeld plaziert und einzeln mit speziellen Anweisungen versehen werden. Man kann also mit Mann- oder Raumdeckung arbeiten und seinen Stüremern verklickern, ob sie den Torerfolg eher in Sololäufen oder der Paßspiel suchen sollen. Etwas mehr hat sich bei der Grafik getain, dann es wurden nicht nur die unzähligen Menüs einer Schönheitsoperation unterzogen: Das Feld ist nun in Iso-3D zu sehen und wird je nach Einstellung von kaum animierten Sprites oder körperlosen Spielernummern bevölkert. Ein Text kommentiert dabei sämtliche Ballkon-takte, und ein paar Zwischenbildchen lockern das onsonsten nach wie vor recht trockene Geschehen auf. Die Geschwindigkeit, mit der das Match abläuft, läßt sich sogar stufenlos regeln, aber natürlich ist die Hauptarbeit ohnehin quasi hinter den Kulissen zu leisten. Da durchforsten Scouts den Transfermarkt gezielt nach Verstärkung, und in harten Verhandlungen erhält schließlich der Meistbietende den Zuschlag. Außerdem wollen die Verträge der Schützlinge verlängert und diverse Versicherungen abgeschlossen werden. Und in Sachen Stadionausbau sind dann überdachte Sitze, Imbißbuden und genügend Parkplätze für die Fans ebenso wichtig wie Rasenheizung oder luxuriöse Umkleidekabinen für die Akteure. Angesichts der Augabenvielfalt ist es ganz praktisch, daß man von einem kompetenten Mittarbeiterstab unterstütz wird: Neben Arzt, Jugend- und Ko-Trainern gibt es einen Assistenten, der sich auf Wunsch um lästigen Pflichten wie die Überwachung der Trainingspläne oder das Organisieren der Bandenwerbung kümmert. Von den übrigen Features seien hier nur noch die Pokallwettbewerbe und zahllosen Statistiken erwähnt; Spielstand und Taktiken dürfen jederzeit abgespeichert weden. Hat man sich erst mal mit den vielen Menüs und Icons vertraut gemacht, managt es sich angenehm flott, und weil ein Fußballstadion nun mal kein Orchestergraben ist, wird man auch mit dem mäßigen Titelsong und den dürftig gesampleten Sound-FX leben können bzw. müssen. First there was the 'Charlton Athletic Nil' joke. The idea of Premier Manager 3 is t start off as the manager of a Vauxhall Conference side and, through wizardry and financial acumen rise to the giddy heights of the Premier League and European glory. But you can ignore all that if you want and stay in the Conference league. The choice is yours. PM3 is a football management fan's football management game. It has all the classic elements you can think of; lots of stats, in-depth match reports, youth team management, sponsorship deals, director's cash hand-outs, tactical decisionmaking and lots more stats. It plays the same way as a hundred games that have gone before it (most notably of course, Premier Manager and Premier Manager 2) and having drawn on that huge wealth of experience, it does it very well. Very, very well indeed. If you've enjoyed playing football management games before then go out and buy this one. I know that sounds like the classic reviewer's cop-out (Damn your eyes - Cop-Out Ed) but in this case it's true. PM3's got every element that you've seen before and they're put together seamlessly. You can lose yourself in this game for days. The only thing it doesn't have is a big new idea to make it a groundbreaking game in its ow right. And there are a few rather niggly problems that stop it from being a clear 90 percenter. First, it's a bit too hard. Starting you in the Conference means that you're competing for only one place at the top of the table for promotion. This means that right at the beginning of your playing career, you have to have a perfect season before you're promoted. This means that the game is most difficult when you're new to it. The way it gets easier as you go along isn't quite fair: it's not because you improve but because there are just more opportunities to make money once you're out of the Conference. The game shouldn't be this hard. The manual makes the unforgivable error of suggesting that you save the game before major matches so that you can reassess your tactics if you lose. They mean for you to play difficult games again and again until you win them. Or cheat, to be more precise. Secondly, you have no opportunity to view the opposition before you get on the pitch with them, except for a fairly useless display telling you the relative strengths of their goalie, defence, midfield and attack. Fair enough, in real life teams are often coming out with surprising formations to try to outfox an opponent, but in PM3 you have no idea of the style they might normally use. Nor do you know the relative abilities of individuals in the opposition team, which players are tall and good headers for example, which makes the man-to-man marking option almost useless. Finally the tactical options (see box) are over-stressed. The manual again suggests that you change formation every match to try to counter opponents' strengths and weaknesses, but constantly fiddling with every player's individual tactics can wear you down. As soon as it gets too dull and you decide you can't be bothered changing your winning combination again, you're done for and sliding back down the table. Once you have seen Sensible World Of Soccer the problem with PM3's tactics becomes more obvious. While SWOS actually has more options tactically and it's no easier to set up your own formations, it does have one spectacular advantage. SWOS doesn't require you to change tactics every game. You can never relax your concentration with PM3, which is going to annoy anyone who hasn't the time or fanatical inclination to play it religiously. 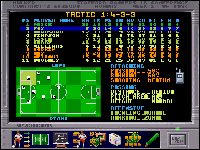 PM3's the most comprehensive football management simulation on the Amiga. On the other hand, while the Championship Manager range has fewer tactical options it does, in its favour, have a more usable interface and a better 'feel' for football. As is ably pointed out on our letters page this month, though, all these games still suffer from the over-proliferation of numbers to describe players in preference to more atmospheric characterisations. PM3 is a great game that's fun to play, but there's still sadly nothing very original about it. PUSH UP FROM THE BACK LADS! Every player can be given individual instructions. The first and most obvious is a positional one. The pitch is divided into 12 squares and you can define where each player will be when the ball is in any particular square. Or at least, the position they'll try to reach to the best of their ability. Anything too clever early on in your team's career will only leave you with players out of position. You also control each player's passing, running and shooting using a percentage system. For example, you might want a competent passer to pass 80% of the time he has the bal, running with it only 20% of the time. In addition, you can set the distance from which a player will take a shot (short, medium or long), the kind of pass the player will attempt to make (clear, long, medium or short), the area of the pitch they will aim for (any, left, right or centre) and the height of the pass (normal, low or high). With all these options you can have an incredible level of control over your team. The downside to all this is that it can take a long time to set up your perfect squad. Equally, any substitution you make can involve long periods of positional tweaking as you integrate the sub into the team, perhaps even changing your basic tactics. "Ooh, great reflex save" or "Oh, beautiful stop" or "Oh, that's a terrific save". Sublime, every one. "Great header, great goal" or "Oh what a great goal" or "He's buried that one". The man's spontaneous genius is unbelievable. DOWNERS ...plus a few more that you wouldn't. Excellent game with minimal disk-swapping. It will eat your life if you five it the chance. We haven't seen the A500 vesion yet (the times they are a-changing) but we reckon it'll be just the same. Matt Broughton wonders how many more of the Premier Manager family will be coming round for tea, as he opens the front door to the grandad of all footy management sims. Along with the Ishar adventure games and a certain fish called James Pond, Premier Manager is one of the few games to make it to a third outing. If you are wondering whether a football management simulation is really worth giving a trilogy to, just ask the publishers exactly how many copies of both PM1 and PM2 they've sold over the years, and as Mr Gremlin pats his fat wallet, wonder no more. The Premier Manager games have always been (to grossly understate) extremely successful, and though PM2 has been selling enough units to keep it in the charts up until very recently, number three has arrived, offering the royal fans more of the same. Only with extra bits. PM's success is generally put down to not only a good mixture of strategy and play, but the overall user-friendliness of the product. 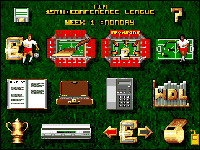 By making use of a striking icon system, PM managed to bring the genre of football management games from traditionally text based affairs, to more attractive packages. So what is there to add to the already impressive PM2? Well, not a hell of a lot really. Peel away the 'vaguely familiar' presentation screens, and you've got the best part of PM2 with the odd new feature in there. As with many sequels, this is really just a re-release, but with a load more options and a few different sequences to watch. The two major improvements within PM3 are the tactics, and the way in which the matches themselves are displayed. 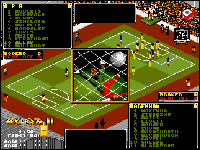 Owners of the original games will be familiar with the rather unsatisfying match graphics that were used previously, with a ball moving left and right across a bar representing the pitch. Though it was fairly innovative, it didn't exactly get the pulse racing, and has thankfully been brushed inside to make way for more pleasing graphics this time round. 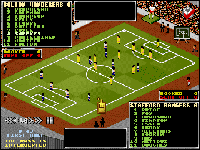 Though essentially providing the same information as the original games did, the matches are now shown in glorious 'Isometric Wooden Player-O-Vision'. Again, as before, you can alter the speed of the match, choosing to either sit back and make a detailed study of individual players, or just bung it up to Warp factor six and wait for the result. During the match you can chose to view both the players and the ball, just the ball's position, the player numbers, or a combination of these representations. Any moments of excitement, such as near misses or bookings, are accompanied by graphical spot effects and some really excellent sampled commentator cries. You can interrupt the game at any time should you wish to change tactics. I've already mentioned that the tactics department has had a major refurbishment, and I wasn't just referring to the wallpaper. You can now not only select formations and set parameters around how individual aspects of play are handled (e.g. Low Passing, Hard Tackling, Long Shots etc.) but can also place individual players in very specific positions depending upon where the ball happens to be. Away from the matches themselves, most of the menus and options have remained as much as before. The transfer system, the finances, the bill board advertising, the phone, they are all there, albeit with some improved graphical representations, as are the ground improvements and fax utilities. One nice feature is an assistant manager who can be hired to look after all of your training schedules and tedious day to day obligations, although you can still step in at any time and change his recommendations. Although based upon the tried and tested methods employed in the previous two PMs, with the likes of Daze Marketing's On The Ball pushing footy sims into new areas of graphical excellence, some of the match representations look dated. As a first football management game, PM3 is still the more user-friendly of the two (compared with On The Ball) but perhaps that's because it's quite easy to get through without getting too bogged down. My only real criticism of PM3 (apart from the graphical match niggle) is that I find it a bit too similar to PM2, and unless you were a fanatical PM2 player, I fear you might be paying for just more of the same. Or perhaps that's the idea. The most user friendly footie manager game. Premier Manager 3 Editor. It's an editor. For Premier Manager 3. That lets you edit. Everything. You want superstars in your team? You can have 'em. You want Arsenal to play in the Conference? You can (evil chuckle) MAKE THEM. You want to turn Vinny Jones into a cissy? Easy. You want a ground like the Neu Camp in Barcelona? Well actually the editor only lets you have up to 99,999 capacity, but that's not bad. Ah, but I'm not supposed to just tell you what it does am I? I'm supposed to responsibly cast a critical eye over it. So what am I going to say? I know... back in AP44 I said in my extraordinary, compelling and erudite review of Premier Manager 3: "It's a bit hard". And, well, it is. So now with the new editor it's easy - you just make all your players into multi-million pound stars, fire up the game and away you go, winning everything in sight. Except that ironically you don't. I must be some kind of a crap manager 'cos I got Ian Wright to play for Bath City, made all my players superstars and still had no success getting out of the Vauxhall Conference. I couldn't even get Ian to score a goal for me. Anyway, I digress. Albeit charmingly. After Cam's feature last issue drawing parallels between people who use cheats in games and the cheering, leering THRICE DAMNED HORDES OF SATAN you would imagine, correctly, that AMIGA POWER rather disapproves of cheats. PM3 Editor is essentially a glorified cheat for the game and therefore not the kind of thing we approve of. However there is a good reason to buy it and that is to keep your players up to date. No football game on Earth can hope to keep pace with all the action of the transfer market, but Gremlin have done a good thing and given us a tool with which to keep all our information current, thereby eliminating the need for data disk purchases in the future. And between you and me, while Cam's busy on the phone, it can be fun to cheat a little bit. That player you always thought was vastly under-rated? Not any more. He's a star. That team you despise? All their players are suddenly crap. Bath City? European Champions mate. Cheating's not good (although it can be fun), but never having to buy an update for a footy manny game is. Good, that is. Premier Multi Edit System is an editing package for use with Premier Manager 3. 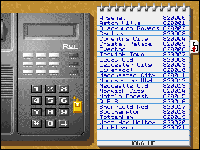 It allows the user to customise the eight major aspects of Premier Manager 3. Each section is selected by clicking on one of the icons. The first icon allows the manager's statistics to be altered, from trivial things like his name and photo, to more important features like length of contract and which team he manages. Next up is the ability to edit player data. This is an area where self control needs to be exercised because it's impossible to change very player's rating to 99%, which quickly makes for dull gameplay. I recommend trying it with at least one player though! The third icon is more of an extension of the second and allows players to be moved from team to team without the need for transfer negotiations. You want Stoichkov at Wycombe? You got it! Option four allows club data to be altered, everything from keeping up with ever changing football strips, to lowering the safety rating of teams you don't like or increasing the cash reserves of struggling clubs like Gillingham, so they can afford the likes of Klinsmann and hit the big time. Or perhaps not. The next two options allow you to completely rebuild league tables and change the countries and stadiums at which up final matches take place. So you could construct a league entirely from superteams or have the European Cup Final take place at a non league stadium! Perhaps the best and the most amusing option is the one that allows you to change the terms used for player ratings, so instead of being 'good' they could be termed 'groovy'. You can change the names of injuries and how long they will keep a player out of action, in my version an upset stomach now affects a player for 23 weeks! It's hard to rate the Premier Multi Edit System as it isn't a game in its own right. Assuming you can stop yourself from mucking about too much then you'll find it a very useful product, especially if you want to keep your favourite team as up to date as possible. When Premier Manager first came out I remember playing it for around 12 months non-stop - unfortunately I'm not kidding. I managed to take then non-leaguers Wycombe Wanderers to the height of Division 1 football and when my contract expired and I took on the job at Manchester City, over the next few seasons I managed to win every domestic and European trophy on offer. This was the exact point I thought "Right! Where's my social life gone?" About a year later my appetite was to be dangled over the freshwater lake that is Premier Manager 2. Although underneath the same game existed, it featured some superb match sequences and generally it had been polished up graphically, I didn't spend as long on the second version, mainly because I'd seen it all before and it was just too damn hard. I managed to take Halifax Town to Division 2 when I was offered a job at my local side Stockport Country and from then on I failed miserably. When Premier Manager 3 came along I knew that after two previous versions, if anyone could strike up the perfect game then it had to be Gremlin. So what exactly is Premier Manager 3 Deluxe? Well, it's a like a luxury version of Premier Manager 3 because it comes with the much fabled Multi Edit System, which allows you to alter everything in the game, be it team names, player names, ratings, league structures - the lot. Also, the actual editor has been around for some time but only now have they decided to bundle it in with the full package. 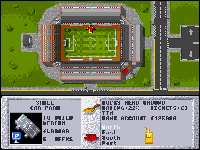 I think a Premier Manager 4 version of the game isn't the answer because surely Gremlin would be pretty hard pushed to find completely new ways of presenting the same football simulation. Consequently, I think the right idea was updating all the information and re-releasing it, so if you haven't already got it you can buy the whole updated game, although if you already have it you could invest in the Multi Edit System and update it yourself - if you have the time. There are no additions to the actual management side itself - the new 95/96 teams are the only addition. For instance, you will now find Juninho at Middlesbrough, Asprilla at Newcastle, McAteer at Liverpool, and all the updated league structures and rules. On your substitution bench you can have three outfield players and sacrifice the goalkeeper entirely from the team, therefore if your keeper gets injured or has to take an early bath you will have no other choice than to stick an outfield player in goal. Considering how well Steve Nicol did for Sheffield Wednesday and Vinny Jones for Wimbledon, I wouldn't bother. The Multi Edit System is based along the same lines as the actual game. The icons appear at the foot of the screen and you can cycle forward and backward through the various values by the left and right mouse buttons. In all you can edit the teams, managers, kits, players, ratings, ground capacities, ticket prices, ground name, safety ratings, and league tables, and you can even edit how long you'll be out for a broken arm. You can also edit your start position so you don't have to begin your career in the conference - you can zip straight to the top of the Premier League. The whole system is really easy, efficient and user friendly because you can swap players. Usually in editors you have to enter all the new data via the keyboard which would take absolutely years, although in PM3 MES two teams appear on screen and you can select with the left mouse button and swap with the right. It's that simple. If you can navigate the actual menus in the game you'll be able to update the information. Right, I am going to award this game on the merits of the package itself, not as a sequel to the original Premier Manager 3 because it's no different. Do not buy this whatever you do if you already own Premier Manager 3. Otherwise go out and buy one today! Well here's an odd fish. Premier Manager 3 first jogged up and down the touchline way back in November 1994 (reviewed AF66 85%). By this time, Gremlin's football management trilogy was renowned in the circles where young men gathered excitedly around screens arguing the benefits of 4-4-2 against the sweeper system. And then, some months later Gremlin saw fit to release the Multi-Edit system which allowed you to swap and change names and statistics. That's if you bought the original Premier Manager 3 of course. And now you can have them both together. But let us briefly tread old ground. Premier Manager 3 arrived during a hectic period for football management simulations. The old guard, primarily our friend here and Domark's Championship Manager were being challenged by the breezier soap opera that is On The Ball and later, the splendid Ultimate Soccer Manager with its ground-building-before-your-very-eyes and 'bung' options. PM3 is an altogether more sober affair, preferring the old school tactics of mass statistics. 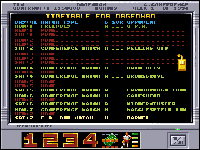 Its major advance was the introduction of a matchplay interface which let you watch the games in a variety of ways - you could see which player were following your barked orders. And it also introduced a European transfer market - not problem gaining work permits for players here. PM3 is undoubtedly one of the most difficult management sims. You start off as boss of a Vauxhall Conference team of your choice and you have to work your way up the leagues. A cool feature, because one imagines most, if given the choice, would begin in Arsenal's Marble Halls or at Old Trafford. However, both PM3 and the separate Multi-Edit system have already sold by the bucket load, and all the Deluxe version contains is both titles and a few upgraded players and stats. Some of the players in the lower leagues are a year out of date, though. And Gremlin, in their wisdom have set no recommended retail price so it's impossible to tell you whether it's value for money. If you haven't got PM3 and you can pick this up for a tenner then heck, why not. But the whole package smells strongly of 'cash-in'. Gremlin aren't working on any new Amiga games so why not package a couple of their best sellers and call it "Deluxe"? If you can get this for £10, great, otherwise play Ultimate Soccer Manager, it's more fun. People involved in public relations worry me. Not to the extend that I lose any sleep, or trigger migraines, or feel the need to fritter my hard-earned cash away by reckless gambling at the local bingo hall. They just do. Especially when they write this sort of thing on their press releases: "More fun than a night out with a) Trevor Brooking, b) Paul Merson (before the haircut) or c) Savo Milosevic's wife (Tick as appropriate)." Thankfully, PM3 Deluxe is rather more entertaining - along with every other Premier Manager prequel, natch - though not entirely the new release I'd expected. Grr. Following in the footsteps of SWOS and Ultimate Soccer Manager, Premier Manager 3 has been re-released with team data and stats updated to coincide with the 95/95 season. Which is nearly over. And now that you've glanced at the price, I'd like to reassure you that there is more to the "Deluxe" tag than just updated information. But I'd struggle. Because what Gremlin have done is update information on the original PM3 and bung in the Multi-Edit System which was initially released last year to save you buying another management sim ever again. Bit of a nerve? I should say so. Still, for those of you who are unfamiliar with PM3 then this is just the ticket. 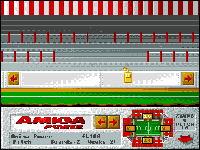 PM3 is one of the finest footy management sims available on the Amiga. You begin your career with a lowly Conference league side, with which you are expected to gain promotion in your first season. A heady task, but certainly within the capabilities of managers who are to make it at a higher level. However, I'd much prefer to have the opportunity of managing Notts County from the start, regardless of the league they're in, and experiencing the highs and lows with my favourite team. Should I wish playing a computer game to reflect my weekends. As one might expect, PM3 doesn't differ much from your average stat-filled management sim. When you've finished hiring and firing for the week, there's Saturday's team selection and tactics to consider, bills to be paid, the Amiga Shopper advertising hoarding to be replaced and a comforting phone call to be made to your star striker to boost his morale. Everything exists to ensure that you feel in control of your club. Which, in turn, allows you to then lose control. Hnngh. As with every other footy game, the main problem with anything that tries to re-create the present footballing scene is that transfers, loans, suspensions and injuries occur daily. No sooner have you spent £25 on an updated version than it's rendered worthless by young Terry Spooner's £10,000 transfer to Torquay United the very same day. So thank merciful heavens above that Gremlin have seen fit to include their Multi-Edit System in this little package. You can tinker with everything from the stadium name to the ground capacity and the team kits to the player's names and stats which makes a welcome change from not being able to.SWOS team editor. Ahem. At the end of the day, if you have yet to buy a footy management sim, make this the one and you need never buy one again. Honest. As for being more fun than a night out with Savo Milosevic's wife, you've got to be joking. Have you seen pictures of her? UPPERS It remains the most comprehensive footy management sim available and the multi-edit system actually works. DOWNERS You need time to become successful, as everything is infuriating complex, and the Multi-Edit System doesn't work on SWOS. Natch. As the season draws to a close PM3 remains a title contender and, while its price tag is perhaps a little dubious for something which has been released before, is a game no footy fan should be without. Cor, you won't believe how much faster this sim runs on an A1200. Nor should you. Gremlin's Premier Manager series has been on the go for donkeys years and is one of the most popular footy games ever. We haven't seen anything from this Sheffield based software house for nearly a year now so a parcel thus post marked and obviously filled with a box crate a bit of a stir. The last item they sent us was Premier Manager 3 Multi Edit, a support program for the PM3 series. Just what could this be? Not to be outdone by SWOS, Player Manager and Ultimate Soccer Manager, Premier Manager 3 has had the latest teams and league structures bolted on to bring it bang up to date with the 1995/1996 season. The basic game remains the same though and they've been good enough to supply the original manual. In fact the packaging is pretty comprehensive: it's nice to see that Gremlin aren't trying to do what is definitely, possibly, maybe, their last Amiga game on the cheap... though the fact that they claim to have sold over half a million of the various versions of this one program so far may have something to do with this too. The Multi Edit software released last year is included in this version too. This means you're getting two programs. The Multi Edit is not a data or update disk, it is designed to operate separately, creating save games for the full program. This it does well, allowing you to crate your own scenarios and even edit the on-screen text and messages. Premier Manager 3 stands the test of time. As a comprehensive football management sim it is still one of our office favourites, alongside On The Ball and Ultimate. When originally launched we felt that it was a little too like PM2 for comfort, and if anyone took our advice at that stage then now might be the time to upgrade as the Multi Editor does make this package more interesting. The only problem marking this game is the fact that Gremlin have supplied it to us with no fixed price. If someone sells it for under £20 and you're in the mood for an upgrade it's good value. At £25 or more you might do well to wait and see if Domark's Championship Manager 2, the only genuinely new sim on the way, has the necessary ooomph to tackle you by the short and curlies.